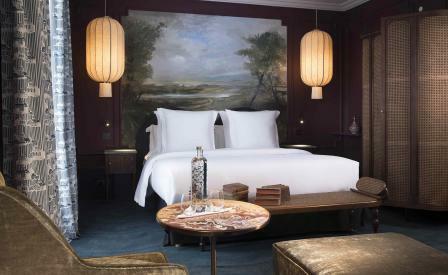 The second opening from the independent group Les Hoteliers Impertinents, the Hotel Monte Cristo in Paris pays tribute to the literary great Alexandre Dumas and his hero, envisaging what would be a modern-day home for the adventurous Count of Monte Cristo. The Count’s travels and Dumas’ own Caribbean ancestry provide a unique starting point for the hotel’s design, which has once again been entrusted to Pauline d’Hoop and Delphine Sauvaget after their success with sister property C.O.Q. The bedrooms’ tapestry-covered walls depict scenes from far-flung lands, tasselled lamp shades throw palm-shaped shadows, and a rich selection of velvets, bold prints, and precious materials reflect Dumas’ famously exuberant character. Modern luxury in the form of bespoke furniture, fine fabrics, and hand-crafted accessories has been combined with an eclectic mix of antique treasures – including a curiosity cabinet of taxidermic tropical birds. The finishing touch is the hotel’s own monogram, which can be found adorning everything from the fine porcelain crockery to the plush carpets. Downstairs the secluded spa area takes its cues from the Orient, with a sapphire-coloured pool set against a backdrop zellige-tiled walls and exotic foliage. As a tribute to Dumas’ ancestors, who were rum producers in St Domingo, Hotel Monte Cristo also boasts the first dedicated rum bar in Paris. With an extensive collection of specialty and flavoured rums, including vintages that have been created exclusively for the hotel, don’t miss the chance to spend an evening sipping expertly crafted cocktails under the salon’s leafy palms.